The eclipse, as reflected and filtered through a tree onto the ground outside D Magazine HQ. Photo by Alex Macon. 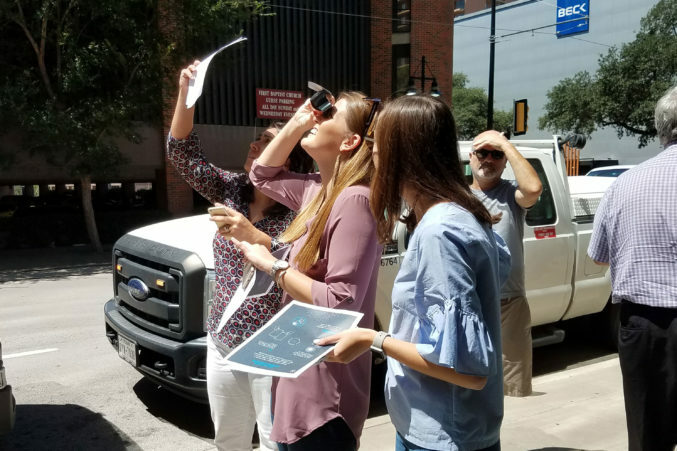 We were pretty impressed by yesterday's show, but it should be outdone when Dallas is in the eclipse's path of totality in 2024. Hustling around downtown Dallas yesterday morning in last-minute pursuit of a pair of NASA-approved eclipse glasses, I witnessed firsthand some of the earthly fervor that greeted the day’s cosmic phenomenon. I first hopped on the closest bicycle proffered by one of our new bike-share programs and pedaled furiously to reach the central branch of the Dallas Public Library, where I was too late to grab one of the 50 free pairs of glasses. The library had some educational programming lined up before the main event, a sizable and attentive audience taking it in. 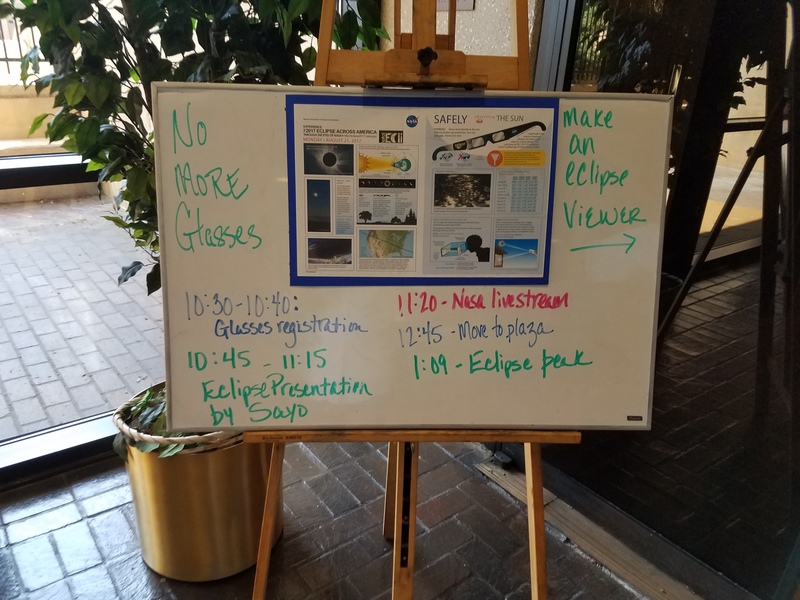 I was told there would be an opportunity to craft pinhole projectors to safely view the eclipse, but I’ve never been much for arts and crafts, or for school, and time was of the essence. The moon waits for no man. The sign Monday at the library. Outwardly cursing the morning meeting that had made me late to the library and inwardly musing at the money I was now costing my employer in lost productivity, I biked back across downtown to a watch party at the Perot Museum. 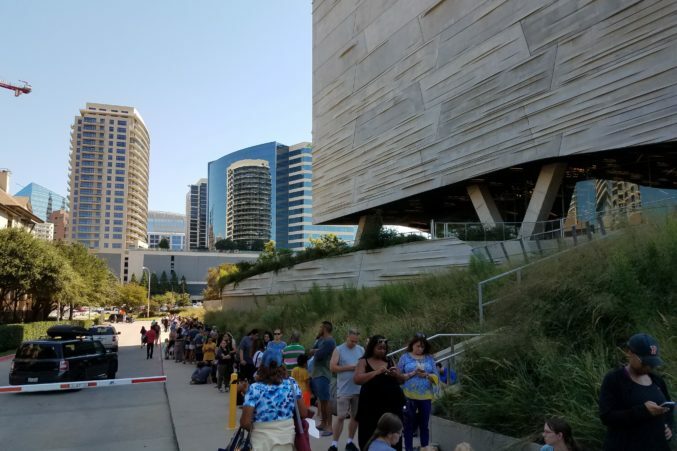 At the Perot, it was friendly pandemonium, well-organized by knowledgable museum employees, with hundreds of would-be sun-gazers wrapped around the building and waiting for eye protection. 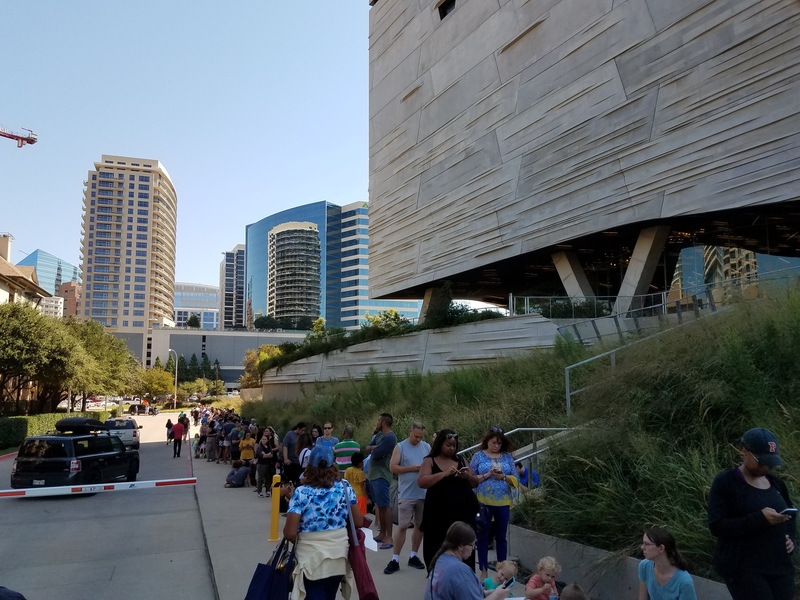 I lack the patience for that kind of line, and I lacked the cash for the scalper on the other side of the museum, hawking eclipse glasses for $20 a pop. Part of the line at the Perot Museum. I was then resigned to watching the partial solar eclipse’s reflection in light filtered by a tree, like some kind of primitive in a world where human tools haven’t mastered the art of staring at the sun straight on. I also weighed the pros and cons of blindness. Back at the office, at this point sweating like I’d just returned from a brisk sojourn in the Sahara, I learned I should have begun my search closer to home — or in this case, work. A colleague, whose mother was gifted with amazing foresight and capacity for preparation, was packing two pairs of eclipse glasses. A small crowd gathered on the sidewalk outside of our building to watch the moon pass in front of the sun. 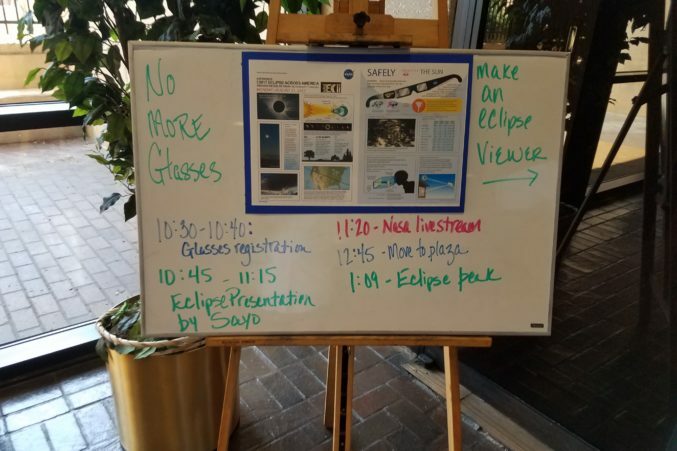 We used the glasses, passed around pinhole projectors, and marveled at the fact of incomprehensibly huge solar bodies, including the rock we occupy, moving through space. Keep a little childlike wonder in your life. People stopping their days to look at the sky and share a moment feels special. Don’t let anybody tell you otherwise. Watching outside D Magazine HQ. Even at 75 percent, I thought the eclipse was, as they say in science, really cool. So imagine how cool it will be on April 8, 2024, when Dallas is in the direct path of another total solar eclipse. Seven years from now, we’ll get the full 100 percent, a full blacking out of the sun. We were impressed by Monday’s partial show, but this one will be the real deal. Save the date.